On board the Golden Eagle, our ubiquitous Train Manager, Tatiana, conducted almost daily Russian classes.They were both useful and highly entertaining. By the time of the Farewell Evening we were able to join in a vigorous rendering of “Kalinka maya” during our music-bar/lounge evening. Dan, our Oxford Professor, was also tireless, presenting, explaining, enlightening. His series of lectures, complete with a freshly assembled final reading list, included numerous topics. Among those covered were the conquest of Siberia and the valuable fur trade which drove the Russians towards the Pacific. Other topics were Red Siberia that depended totally on the train as Lenin understood that “if the trains stop that will be the end for the Reds” and pre WWII Siberia, initially beaten by backwardness, yet only 10 years later ready to face Nazi Germany, in part due to the world ‘s largest steel plant at Magnetigorsk. Post-war, the enormous oil and gas discoveries are seen as a source of developing wealth. In turn, the exciting story of the backbone of Russia, the Trans-Siberian Railway, its evolution and importance for freight transportation, gave us understanding to what we could observe daily on the tracks, the roads even today not good enough for regular year-round travel. A final lecture on Siberian exile up to Solzhenitsyn and the Soviet Gulag prison system, explained the tragedy of a region which swallowed 20 million people, even if, in the past for the peasants, Siberia stood for freedom from serfdom. Prisoners still exist and more recent high profile deportees included Mikhail Khodorovsky although his forced exile, currently in Switzerland has rendered him less relevant to Russians today. Soon enough we reach Novosibirsk created around the Trans-Siberian Railway bridge over the river Ob. The city developed so fast that for a time it was spoken of as the Chicago of Siberia. Now with 1.5 million people, and the Siberian capital, it has one of the youngest populations in the world. These Siberians see themselves as the “purer essence of Russia” and remain warm and hospitable, quite open to outside influences, visitors and fashions (including some of the highest heels on ladies shoes that I have seen anywhere). This is now a wealthy region since the post-soviet privatisation of Sibneft and the largest oil refinery complex in Russia, run by Gazprom Neft. Oil and gas produce 70% of Siberia’s budget, replacing the former local military industries. 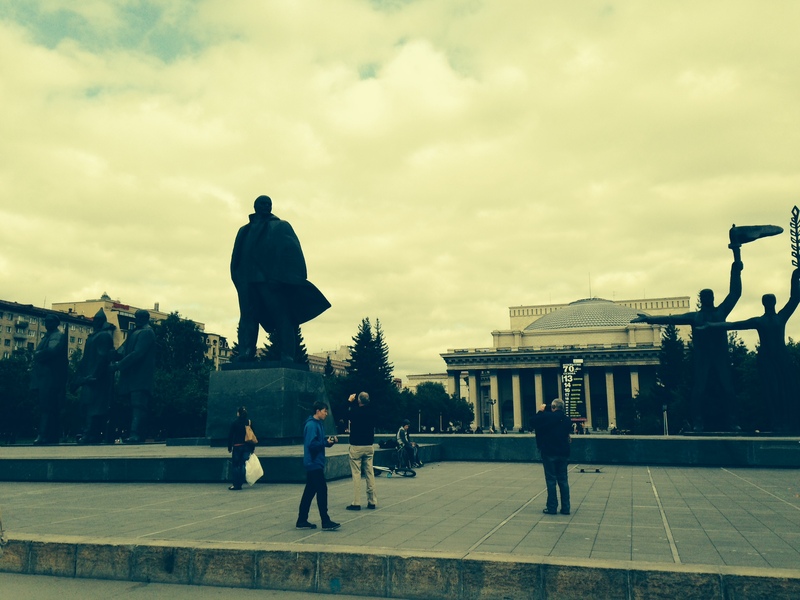 Inevitably the focus of this city is Lenin Square. A solid statue represents Lenin as the Revolutionary Leader facing towards a distant horizon. He was characterised by Pasternak as one so focused as to be “narrow minded to the point of genius”. 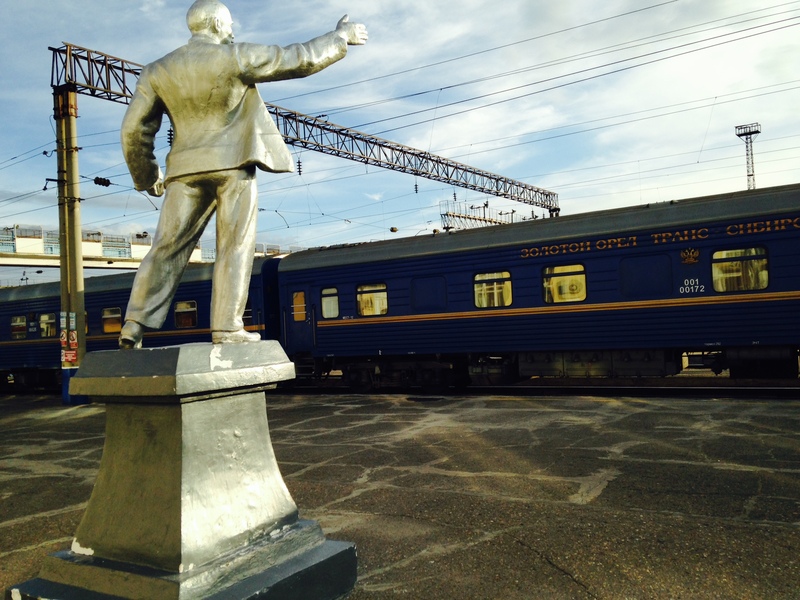 In the various provincial stations such as Belogorsk where we stop along our journey, Lenin is usually portrayed in full speech, arm upraised in emphasis as at the famous Finland Station arrival, to inspire the Bolshevik revolt. However at the mausoleum in Red Square, Moscow, the embalmed figure is closer to Pasternak’s observation that “…for decades after…the spirit of narrowness is worshipped as holy”. On the square, we visit the Opera House. Larger than the Bolshoi in Moscow, it has a huge stage of 1,300 sq.mts. Sometimes referred to as the “Siberian Colosseum”, it was prepared to accommodate the rousing parades of the Stalin period when at times outside temperatures dropped below minus 40 centigrade. The company also produces a steady stream of excellent ballet dancers. Ballet school studies are free of charge. Our final visit of the day is to the open air Railway Museum outside the city. The exhibits range from ultra streamlined snow ploughs to the barred compartments and cells of the former prisoner transport carriages. Returning to the city and the Golden Eagle, we pass the Akademgorodok, a former concentration of Soviet scientific brain power. Now financed privately by venture capital from Intel and Schlumberger it is nick-named the “Silicon Forest”. Back on the train our maps show that Semipalatinsk is only a few hours south of Novosibirsk. There, the Soviet Atom Bomb program was developed involving over 450 nuclear tests and accompanying radioactive fallout. It was also the town where, after Omsk, Dostoyevsky was forced to complete his last years of exile, this time as a soldier. His years of hardship and reflection were followed by the great novels, most notably The Brothers Karamazov a book which contains the complex parable of Christ returning to earth but being confronted by The Great Inquisitor, seen as yet another window onto the Russian soul. The parable was a challenge for actors to present on stage but was rendered brilliantly by Sir John Gielgud (and worth looking at on You Tube) making Dostoyevsky relevant for all times.